I am very excited to show these Sea Lore polishes to you today. This is a new indie brand out there. I have to say that the theme of this collection like Steph's Disney + nail polish addicts idea of perfection. I've mentioned this throughout my blog since the beginning that The Little Mermaid is my favorite Disney movie ever. I was so psyched to see Sea Lore did a collection themed based off of Triton's daughters. I am over the moon! The collection theme is clearly great, but the polishes themselves are just as great too. 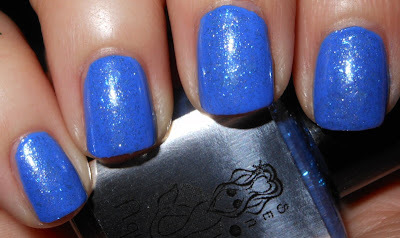 Aquata is a deep sea blue jelly base with blue shimmer and blue iridescent flakies. Andrina over OPI Do You Lilac It? 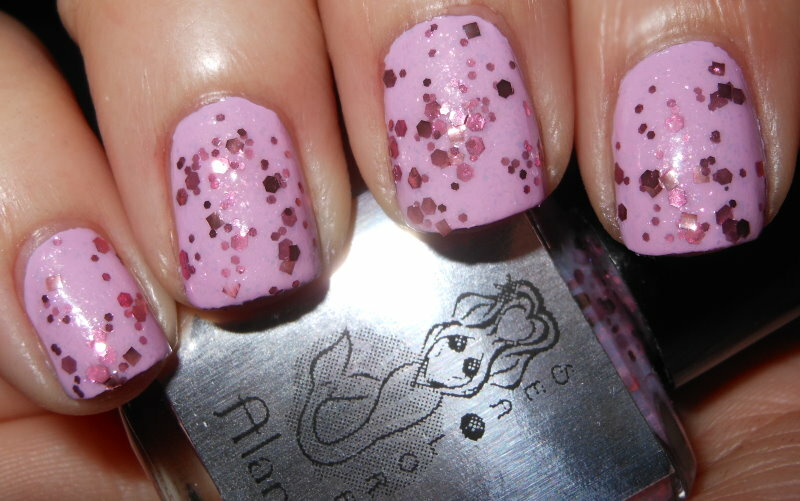 Andrina is a deep sea urchin purple jelly base with purple hex glitters and purple shimmer. 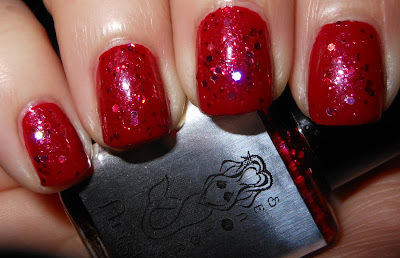 Arista is a deep crimson jelly polish with red holo hexes and red shimmer. 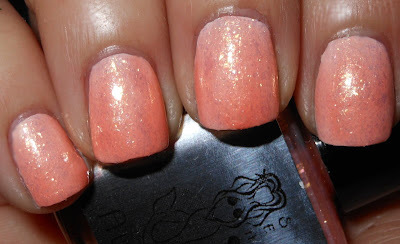 Attina is a coral jelly polish with golden shimmer and golden iridescent flakies. 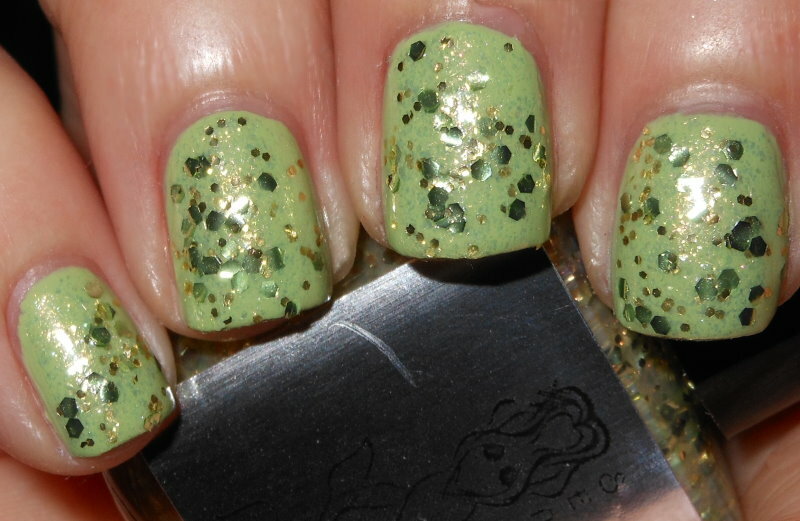 Adella is a seahorse yellow jelly base with mint green hexes, gold glitter, and golden shimmer. Alana is a sea anemone pink jelly polish with rose colored hexes and rose shimmer. 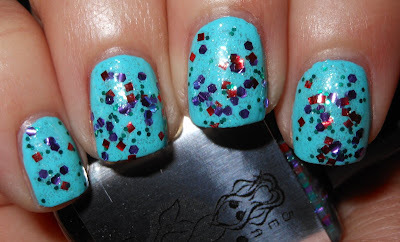 Ariel is a bright turquoise jelly base with red squares, purple hexes, green glitter, and green shimmer. I absolutely adore this collection. It is adorable and the colors are great. The colors are 100% reflective of Triton's daughters. These are definitely meant to be top coats. I think you could achieve opacity with these in 4 coats, less with Aquata and Arista, but a base really brings out these polishes. What really stood out to me about Sea Lore and these polishes is how thoughtful they were. These are not just chunky glitters in base, these have the addition of micro shimmers and flakies. This gives these polishes so much dimension and depth. I am so impressed with this because it would be easy to just put glitter in this an call it day. They would still be pretty, but that extra element really makes these polishes special. These were also easy to work with and apply. You can order Triton's Daughters collection on Sea Lore's website. The 15ml sizes are $10.00 each and the 7.5ml sizes are $5.50. If I had to choose my favorites I'd have to go with Ariel, Attina, Adella, and Alana. You can also follow Sea Lore through their blog and Facebook. One of my fave movies too, great colors and theme! Aaaah! I just love everything about these! So gorgeous and fun! These are so fun! I love Andrina and Ariel! I love how you tried Attina over white to show the true color. Love these!